Quickly Dialing In Your Own Lone Star™ Tone. Want to quickly arrive at a great Tone on a Lone Star? You can certainly use the Sample Settings below or try the following technique for finding your tone quickly. Using this method, most players find they arrive at their sound quite quickly, as they make use of their ears rather than their eyes to dial in their tone. This process can be used at any power setting on a Lone Star. 7:00 to 11:00 - provides the cleanest, least saturated sounds and in this region the sound will be brighter and contain more upper harmonics lending a three dimensional character to the sound. 11:15 to 2:00 - enhances the saturation & replaces some of the upper harmonics with a richer, warmer quality & a fuller bottom end response. It’s not yet fully saturated and perhaps the easiest range to get a great sound from on either channel. 2:15 to 5:00 - saturates the signal & enhances low and low mid frequencies. While this region provides the maximum saturation & therefore sustain, it also compresses & softens the attack characteristics. Use this higher region of the GAIN control sparingly & only when maximum sustain is needed. For Channel 2, activate the Drive Switch if more gain is desired. In DRIVE, additional tube stages are added in front of the normal “rhythm” circuitry to produce a multi-stage high gain lead channel. Set the Channel’s Master volume control – a setting between 9:00 & 2:00 is recommended for most applications. 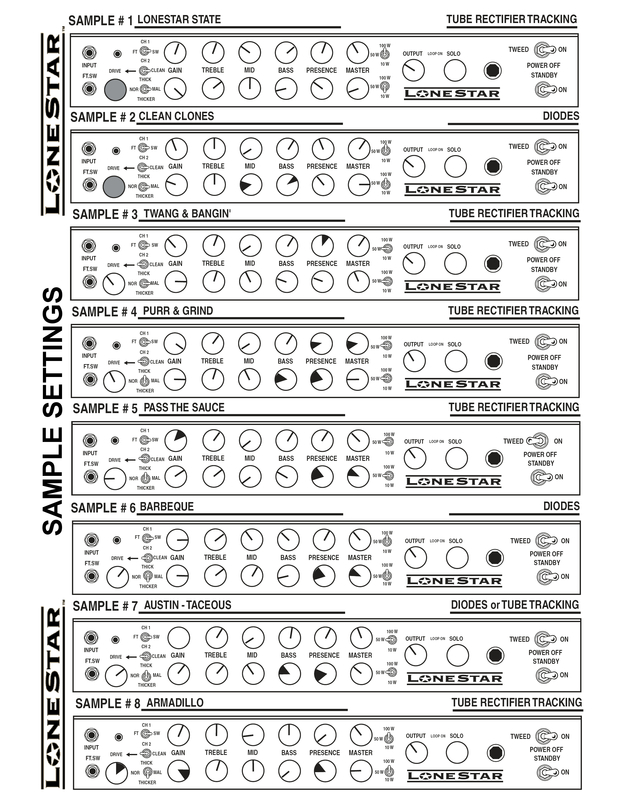 Set the Lone Star’s Output volume control (if the Effects Loop is not Hard Bypassed - also keep in mind that the Effects Send Level control on the rear panel of the amp also acts as a volume control when the Loop is active, so be sure to have it turned up - the 12 o'clock position may be a good starting point for the Send Level control). Turn all tone controls (Treble, Mid, Bass & Presence) to their lowest setting. Play an open string on your guitar (the A string will do), grab the Treble control and turn up until you hear the desired amount of highs you would like in your tone. The Treble control is the dominant tone control in the Lone Star and the first tone control in the signal path. Its setting will determine the balance between it, your Mid & Bass controls. A high setting can also introduce extra gain into the mix. Note: Channel 2’s NORMAL/THICK/THICKER mini toggle switch selects what frequency the Treble control will enhance & therefore allow you to select between three different voicings for that channel. NORMAL - In this position, the highest frequencies are passed through with the best balance between the three tone controls gain wise. THICK – fattens the upper region and smears the line between Mid and Treble to achieve a more robust, throatier sound. THICKER - lowers the Treble frequency even further & adds considerable gain in that region. While continuing to play an open string, turn up your Mid control until the mid frequencies fill in to the desired level. Pay attention to how the feel of the amp softens at lower settings and stiffens at higher settings. Set above 2 o'clock, the control can also introduce gain to the mix. While continuing to play an open string turn up your Bass control until the bass frequencies fill in to the desired level. You’ll find that for higher Gain settings this powerful control fills in quite quickly and lower settings will be preferred. While continuing to play an open string turn up your Presence control until those frequencies above your TREBLE control fill in to the desired level. Lower Presence control settings darken and compress the signal - which works well to fatten single note solo sounds, giving them girth and focus. Add Reverb to taste (controls on rear panel).